This is a Charles Blackman Fine Art Limited edition archival print titled “Four Schoolgirls” made from the original 1960 Oil Painting titled Blue Bouquet and Window. This fine art print is Hand Signed in pencil lower right by Charles Blackman, “Four Schoolgirls” by Charles Blackman is available at Etching House framed or unframed, it is also available on 12 months lay Buy with 20% deposit , see Etching House terms and conditions. Image size – 66.5 x 100cm. Certificate of Authenticity available, this reproduction work of Charles Blackman Four Schoolgirls is not an Etching, Silkscreen, Lithograph but a high quality digital reproduction referred to in some countries as Giclee French word and a practice I have been led to believe was first used by the French. 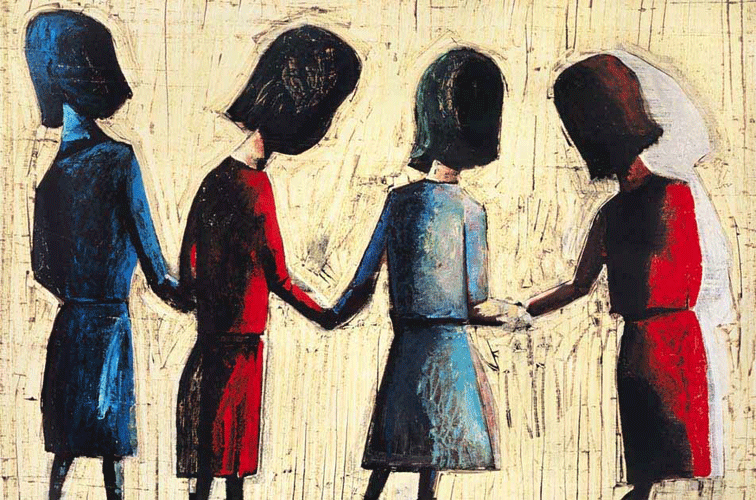 Charles Blackman Four Schoolgirls reproduction print and a collection of other works in mediums such Etchings, Silkscreens, Lithograph, Giclee prints are available at Etching House, lay Buys are welcome on 20% deposit see Terms and Conditions.